After 48 years of marches, protests, boycotts and balls, the revolution will finally be televised. 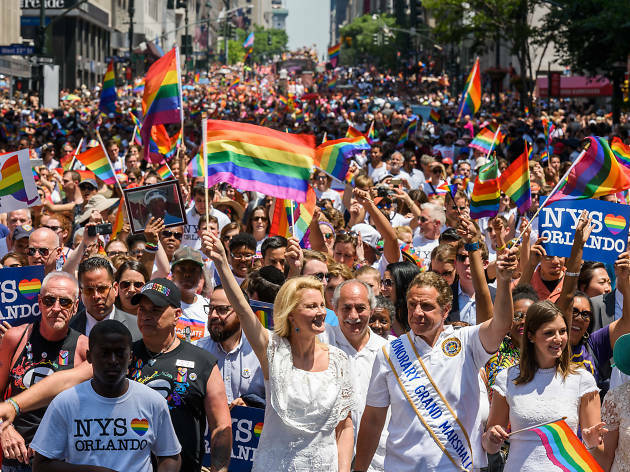 After the 2016 Gay Pride March welcomed two million participants and 35 marching garrisons, it seems that NYC's LGBTQ community has become too loud to ignore, and now local affiliate station WABC-TV is getting in on the action. The Tri-state area channel will air this year's march and connected festivities live from noon–3pm on Channel 7, along with a feed streaming on abc7ny.com. The network will also cover PrideFest, the Pride Luminaries brunch, the Rally and the brand-new Pride Island music festival, which features Tegan and Sara, Years & Years and Patti Labelle. If you're planning on marching but haven't come out to your Meemaw in New Jersey yet, you better make your phone call now, because she will definitely spot you in a Carmen Miranda headdress singing "We Are Family" from a lube float while she's flipping channels. Just a suggestion. Unfortunately, I live outside the US now and ABC does not stream on the computer to other countries. So, I could not see the Parade. I would have liked to have seen it because for it to be televised is an historic event unto itself. Kudos to ABC for having the brass to make such a move. Others may televise it in the future, but there is only one 'FIRST TIME' and ABC was first. What day is the parade held this year? 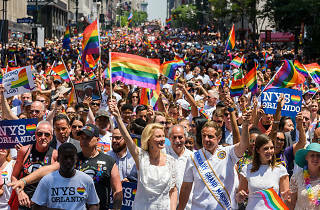 @Newton H ......Newton....And if you do not know why it is in June, it is because it is in commemoration of the Stonewall event that took place in June of 1969. If you are gay and do not know this, you should be beat severely. GRIN! Stonewall opened the doors for the gays and finally allowed us to become a 'community', demanding civil rights. There are several documentaries on Stonewall. Go check them out and show them to all your friends who do not know about it and what it represents. Kudos to ABC for having the brass to televise the Parade. Thank you, ABC. And don't worry about the negative feedback you get. We in the Gay Community appreciate you for recognizing diversity.